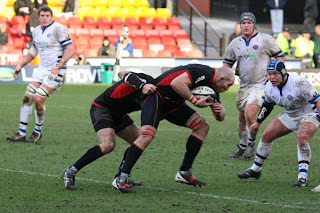 Yesterday's game against Bath was a cracker. Saracens were without talismans in their team - Chris Jack has briefly gone back to NZ for a family commitment; Kevin Sorrell will be out for at least another 3 weeks with an ankle injury, and Captain Neil de Kock was pulled from the squad at the last minute to prevent a hamstring injury getting worse if played on, his place taken by Scrum Half Alan Dickens. But despite facing a formiddable Bath side, the replacements and rest of the Saracens team held their hands (and heads) up to a man. They were strong in the tackles, dominant at the scrum (even scoring a couple against the head, despite being 6Kg lighter than the Bath bruisers). Glen Jackson was on song with the boot, scoring 6 out of 6 attempts at goal. And Brent Russell scored a brace of tries to help the Men In Black to an important 26-20 win. There was plenty of adventurous play from both sides, and some great fast passes out of hand. Plus some big hits as usual! There were other casualties during the 80 minute too - temporary Captain Andy Farrell popped a rib and went off; Flanker Dave Seymour sustained a leg injury and forwards Fabio Ongaro and Hugh Vyvyan also took knocks. Due to Six Nations action next week, Saracens next game isn't until 10th February, so there's a few days to get the boys patched up before they face 11th-placed Worcester in Watford. Meanwhile, the Sarries coaching staff have made another big signing for next season, back rower Michael Owen [left] who will be leaving the Newport-Gwent Dragons for North London. Home-grown Ben Skirving has also extended his contract with Saracens until 2010. Initially overlooked by Brian Ashton for upcoming England squad, he's now been called up after another injury hit the team - good luck to him over the next few weeks! Talking of which, the Six Nations is nearly upon us once more. A lot of water under the rugby bridge since the last one. I'm pleased to say I'll be going along to Twickenham for England's first game against Wales next weekend. And I'll be keeping a close eye on the other games too. Expext more posts soon! It's that time of year again when players are negotiating new contracts as theirs come up for renewal. Several players have made (perhaps) surprising moves over the last few days. Firstly, Welsh Scrum Half Dwayne Peel [left] has announced he's off to Sale next season. New Wales coach Warren Gatland had stated that he wouldn't be picking people who play their rugby outside of Wales, but apparently Peel is a special case. A bigger shock for fans of Bath and Saracens is that England Lock Steve Borthwick [right] is leaving the West Country for North London next season! The Bath fans are justifiably distraught, while the Sarries supporters can't quite believe their luck. Personally, I'm looking forward to the prospect of Borthers and Chris Jack having a few games together. That's if the new boy can displace Hugh Vyvyan, who already seems to be building a strong playing partnership with Jack. Finally, French Flanker Serge Betsen [left] has announced he's retiring from Les Bleus immediately, and will hang up his Biarritz boots completely at the end of the season. I can think of many a European player who won't be sorry to see the old bruiser go. I wonder how many more yellow cards he'll get before he gives up for good! Having lost their last two matches, one home and one away to Bristol, the Sarries faithful were hoping for better things when Biarritz came calling for their Heineken Cup pool match. For the first half hour or so, there were a few heads in hands as the Men In Black seemed to be letting things slide once more. Two paltry penalties were all they had to show for their efforts, while Biarritz had managed a try from Romain Cabannes [left], a conversion and two penalties. Somehow, during first half injury time, Sarries woke up when Hugh Vyvyan [right] managed to get over the line, and Jackson converted. All of a sudden, things didn't look too bad, going in at half time all square 13-13. The Gaffer must have had stern words in the dressing room during the break. 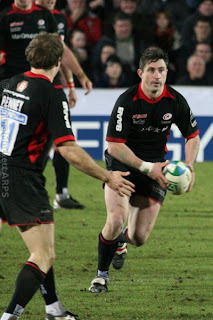 Saracens came out looking like a different team, and basically blew the Basques off the park in the second half! The floodgates opened. Chris Jack scored with a taunting tongue before he put the ball down! [left, you can see Hugh Vyvyan celebrating already]. Then Rodd Penney crossed the line and Jackson converted. 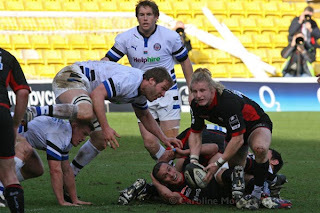 A few minutes later, Sarries were awarded a penalty which the sure-footed Jackson booted over with no trouble. The forwards were dominating the scrum and Fabio Ongaro had obviously been practicing hitting the barn door during training last week, since most of his lineout throws went where they should. 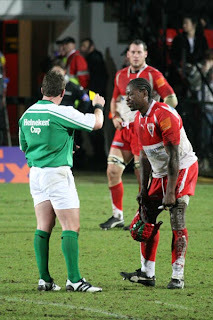 In the 75th minute, Biarritz Bruiser Serge Betsen infringed again, and referee Nigel Owens sent him to the sin-bin for ten minutes. The Basques were down to 14 men, and after Sarries brought on a flurry of replacements with fresh legs, they made short work of putting more points on the board. Chris Jack scored his second of the day. Unfortunately, Glen Jackson was limping badly by then, so Captain Neil de Kock took the conversion - which he missed. But by then, the 4 tries and 5-points were in the bag. Just when you thought it wasn't going to get any better, Saracens pushed deep into Biarritz territory during injury time, and the French knocked on. The Sarries scrum pulped their opposition - which kept collapsing the rolling maul Saracens were getting going 5m from the line. After 3 or 4 resets, each with the same result, Ref Owens lost patience with the Biarritz pack and walked to the posts to award Saracens a penalty try. 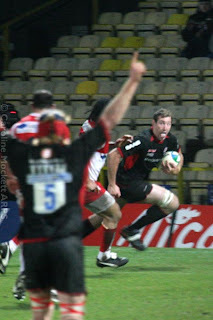 Fullback Brent Russell took the kick and it sailed over to give Sarries a 45-16 victory. Other honourable mentions must go to Man of the Match Hugh Vyvan; as well as scoring a try, he was all over the place, running the ball and making tackles. Andy Farrell, unselected for England's upcoming Six Nations campaign, made a big impact in midfield, as did ever-present Centre Kevin Sorrell [left]. He has started 16 out of 18 games for Saracens so far this season. Of those, he's played the full 80 minutes in all but two fixtures. And he came off the bench after 25 minutes in another game early in the season. The poor bloke must be knackered! 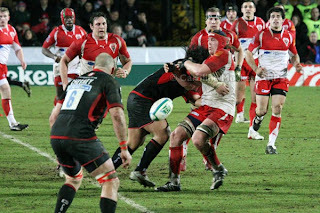 No wonder the Sarries faithful call him Super Kev. He spent 10 minutes in the sin-bin at Bristol last week - probably a chance to have a bit of a rest! So Saracens go into their final pool match at Glasgow on Friday knowing they will go through to the Quarterfinals as long as they can stop the Warriors getting a 5-point win - which is eminently feasible given how close recent games have been.